There is no air brake handle or guages. Is this car a Type A Maggie? This is indeed a “Maggie” interior shot. The “barrel” style controller on the left is the nine-point controller and reverser for the traction motors. The similar object on the right is the controller for the magnetic brakes on the car. The crank shaped lever on the far right is the hand brake. (Note: it may or not be applied, BUT, it’s also not hooked into the safety loop pictured to the right of it. The handle was to be in that loop while running as it would swing back and forth as the car was in motion and sometimes catch and slightly apply the brakes each time it swung to and fro. )Also note that the motor controller handle and reverser are in position atop the controller, and that the brake controller handle is also in place, indicating the car is either in service on layover, or in a division yard ready to go into service. Also, I believe the lever between the hand brake and the electric brake controller was for the sliding gate doors seen to the left and right. The round can-bottom shaped item between the two controllers is the back of the Golden Glow headlight. 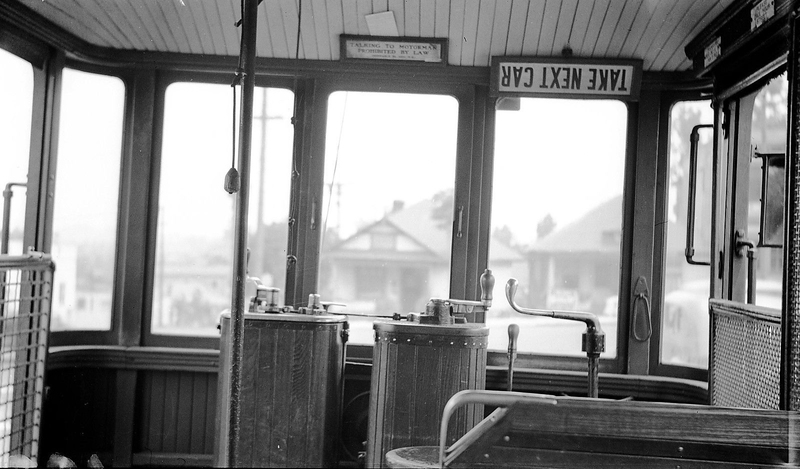 Lastly, the motorman had his own stool to sit on as can bee seen by the round topped object directly in front of the electric brake controller. Maybe someone is familiar with the house seen through the front window so as to ID the location?